Hitch Hiker Electric Pedal Assist * Select Yes (+$1,595.00) No thank you! 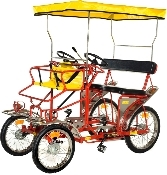 International Surrey Company is a distributor of the well-renouned Sirenetta quadricycles. These world-class four wheel bicycle products are offered at the best prices ever!